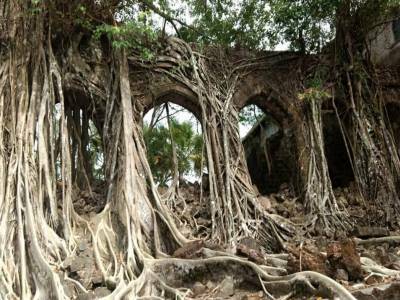 The Ross Island served as the administrative capital of Andaman and Nicobar Islands during the British Rule in India. 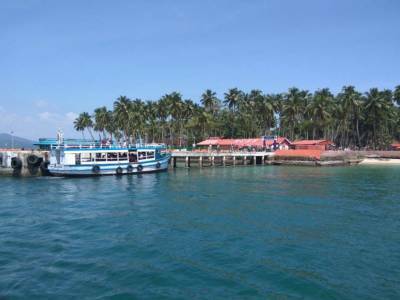 The Ross Island which is very close to Port Blair the present capital of Andaman and Nicobar Islands and is 7 - 8 minutes ferry ride and 30 - 45 minutes boat drive from the Port Blair. 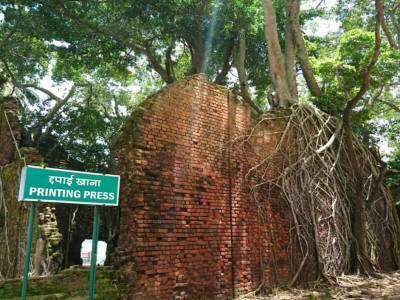 Ross Island was where the British officers lived and had their accommodation, place of worship and also activities for their entertainment like tennis courts etc. 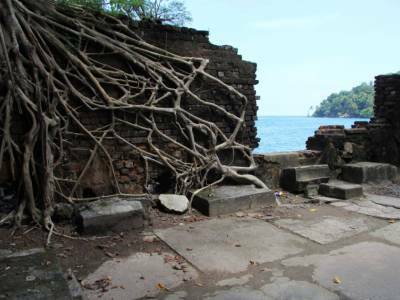 All the British time structures in ruins now and massive trees have overgrown and put in roots around these buildings. Ruins of a large church, cemetery, the Chief Commissioner’s House, a bakery and barracks can be seen. At the southern end of the island there are remains of Japanese bunkers and tunnels from their occupation in 1942-45. Simply fantastic island and pretty spectacular sights to see. The place is full of Deer’s roaming around who are very friendly to human beings. Also many squirrels, Peacock and rabbits could be seen and roam freely. The whole island of coconut palms is a delightful place which can be walked around in one hour. 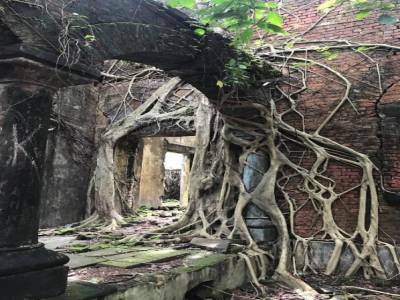 However, two or three hours are needed to see all the ruins and an exhibit of historical photographs near the jetty in a former storehouse. There is a small, basic outdoor restaurant on the island, and a small store where drinks and snacks can be bought. A Light and sound show is conducted daily at 5.30 pm or thereabouts, within minutes of sunset, lasting about 45 minutes. The show traces history back to the arrival of the British, freedom movement, Mangal Pandey, World war 2 and finally the Indian independence. Get quick answers from travelers who visit to Ross Island.